A comet riding Robot approaches the Sun. The space scientists are looking forward with great anticipation because today a riding comet laboratory robot is heading the Sun. The robot, named Philae landing on Comet 67P November last year and its parent laboratories, Rosetta, orbiting nearby. Scientists hope the mission will help them find a more distant origin of the universe. Next Thursday, Comet 67P will reach its closest distances to the Sun, which is 186 million kilometers from the Sun. The heat of the Sun has made the comet's surface hot for weeks to catapult the particles of gas and dust. 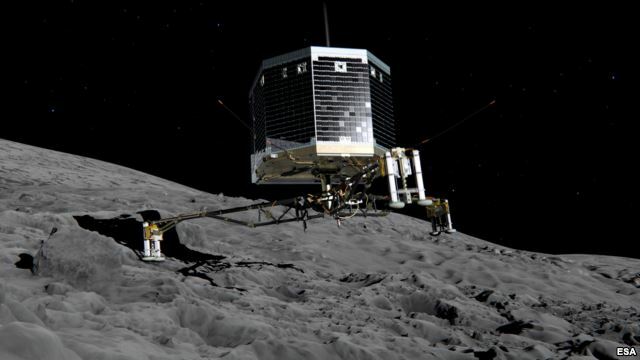 The sensors at Philae and Rosetta will analyze the particles of rare molecules, in particular that may be hidden under a layer of a comet that is usually filled with ice. Because of the great distances, scientists may have to wait weeks or even months until the data sent back to Earth. As we are knew, The Rosetta mission was launched March 2, 2004 by the European Space Agency from its base in French Guyana. It arrived at the comet in August 2014. When the robot lab landed, it bounced into a ditch where it was in shadow and not able to recharge its batteries. It was able to send data before going into standby mode.